In my line of work I have seen so much abuse and injustice that happens in the name of culture. I am a dynamic Zulu woman, raised in a cosmopolitan household so different from normal Zulu households. I guess because my granny was of mixed cultures and I don’t think she even knew what Zulu culture meant completely. I could be wrong, I never learned any cultural practices that I was supposed to learn. All I learned was how to be a dynamic assertive powerhouse who must not be limited by any challenge or circumstances. No one prepared me for my marriage into a family so immersed in culture. It was like I was a child again learning a new set of rules of behavior where a woman is submissive, reserved, quiet, not allowed to take control of her life. It was an awakening to the challenges of womanhood in rural areas but I learned so much. Even though I fought to keep some aspects of my childhood like reading and sitting with my legs folded in front of me. I was scolded for sitting like that “sit with your legs flat in front of you,” my mother-in-law would say. 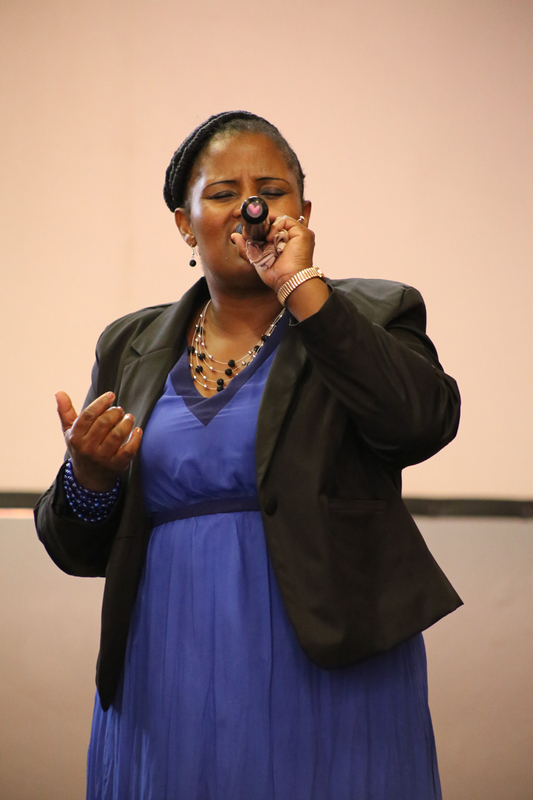 2015 Jan. Jacqui led a song at VMCI – Durban. She is a dedicated member of Idwala. All those lessons prepared me for my work as a gender and LGBTI activist. I understood the boxes that women and men are placed in and our different roles. All that gave me an experience to draw on when I was running gender and LGBTI sensitization workshops. Culture is good it gives us grounding, but many of the practices have been used to suppress women’s voices and to commit crimes against women and the LGBTI community. I was caught in the middle: married woman this side and expected to adhere to all the practices expected of me being a rural wife and a social worker and activist in making learning about gender and also remembering my upbringing. At times I questioned who I was, for a moment there I had role confusion, a dynamic powerhouse as I was raised, a young rural wife, a student, a mother. What was I going to teach my children. All those things put together I had to choose which one was I going to focus on. I decided on balancing everything that I was going through to be flexible in my approach. The trouble began when I dealt with gender based violence cases and men who came into my office undermined my role. It was a struggle that shaped my activism. I had a lot to learn and made it my mission to work on changing certain perceptions. Working on a case of a woman who was abused for wearing pants in Umlazi changed my activism tactics. I also had to change my life. The story begins as a student social worker. I was based in a domestic violence victim support centre at a police station and everyday I dealt with 20 and 50 women. There, I was the professional person giving these women advice and providing them certain interventions to resolve their situations at home. I was also a mother who had to socialize her children the cultural way and submit to my husband and observe all the cultural practices that went with my wifely duties. I had moved back to town but still these cultural practices were active in the home front. My gender awareness was growing in leaps and bounds. My passion for social change grew. I had emotional struggles. I felt two faced as I was advising women on abuse and advised them to set themselves free. In my personal life I was stuck in own shackles. I was a doormat at home and at work an emancipated woman. In the end I had to choose one path. A few year down the line the abuse started, I guess it was his way of asserting himself seeing that I am growing professionally. It was his perception to keep me in line. After many years of abuse, I freed myself from my wifely duties and focused on my activism. There is no greater feeling than knowing you are free and safe that you don’t have to look over your shoulder all time and being worried about your children’s safety and the impact of witnessing abuse everyday. New life began where I could just be me, do what I want to do, go where I want to go and do all the things I never got to do cause I got married too early. My whole life revolved around my boys, family, work and church. I had a lot of growing up to do career wise and worked hard to build my profile as an activist. I learned new strategies. I realized that men saw gender issues as women’s issues and that there were lot of perceptions about masculinity and femininity. I learned that it will take a lot of years to change gender stereotypes. We are 21 years into our democracy and women are still oppressed. There is a long way to go but slowly as activists we will continue with our struggles. Jacqui is qualified social worker. She has worked for 14 years in advocacy for children, youth and women. She has experience in peer education and life skills training and has published a training manual (‘Asifunde’) for peer educators. Jacqui’s career in campaigns and advocacy has resulted in a great deal of media coverage for herself and on behalf of her employers. She has held numerous portfolios within Government structures and machineries that relate to work with children and has been a representative of the children’s sector on Local Aids Council in Umsunduzi Municipality, and the District Council on AIDS. She was the alternate representative for the children’s sector and Civil society Secretariat member on the KZN provincial council on Aids. She has also been a working group member of Yezingane network. Through her work at CINDI network Jacqui pioneered the use of cameras in her child participation work as a tool that could be used for advocacy for the children’s network, and In a role as gender manager she worked on mainstreaming HIV and gender with faith-based organisations. In her position at Amnesty International she was a campaigner for economic, social, cultural and LGBTI rights where she worked at an international and national level. She was elected as the representative for Africa on the Global group on Activism which work on increasing activism at local level and achieving human rights impact. She pioneered the use of participatory methodologies in child participation to which she trained children’s rights organisation on child participation. In her current position she is the provincial coordinator for Ilifalabantwana a multi donor partnership which support government interventions on ECD where she supports and enables the testing of certain interventions with 5 government departments within the province of KwaZulu-Natal. Jacqui is a activist and will always be a voice of the voiceless. This entry was posted in Another Approach Is Possible, Archived memories, Creating awareness, Power of the Voice, We Are You and tagged Abuse, activism, Activist, Activists, advocacy, Advocate for gender rights, Balancing culture and activism, Being dominated, Black Lesbian professionals, Career, Childhood, Children, church, Committed, Confession, Cultural practices, Culture, Education, Emancipation, Emotional struggle, Expression, Family, Feelings, Free, Freedom start with You, frustration, Gender Based Violence, Gender stereotypes, HIV and Gender, Honesty, Human beings, human rights, In her own words, Interfaith organisations, Intervention, Jacqui Mseleku, Jacqui Mseleku-Ngwane, Lessons Learnt, LGBTI sensitization workshops, Life, Life story, Love, Marriage, Married early, Masculinity vs Femininity, Member of VMCI - Idwala, Mother, Oppressed, Portfolio, Reading empowers, Reflection, Relationships, Respect, Rural wife, Security and safety, Serve, Sexuality, Social worker, Socialization, Sons, South Africa, Strategies, Talented young woman, Time, Time heals, Umlazi township, Voice, Witness, Women's issues, Words, Work, Writing our own. Bookmark the permalink.